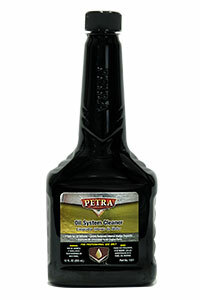 Petra Oil System Cleaner is manufactured to create a safe and effective engine cleaning product. The formulation was designed to be used in conjunction with preventative engine maintenance. The gentle combination of Petroleum Distillates and hydro treated light naphthenic oil provides a common carrier for a solvent designed for the specific purpose of dissolving carbon and other resulting effects from burning oil and fuel in the automobile (passenger vehicle). This highly refined mineral oil, additive and physical appearance dye product will advance the effectiveness of the PMO by reducing toxin content. 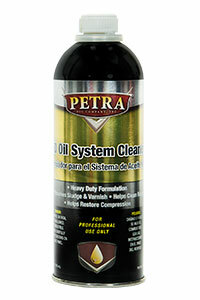 Petra Oil System Cleaner is a fluid intended for the sole purpose of engine cleaning. The product can be used in conjunction with all motor oils and will not impact the chemical make-up of the fluids used after this product in any significant manner. This product is safe for all OEM combustion system and diesel engines. 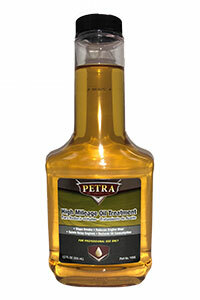 Petra Oil Enhance is a premium product made from special additives and synthetic base oils. This product is compatible with other synthetic, semi-synthetic and mineral based engine oils. 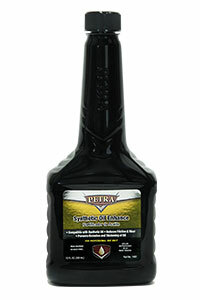 Petra Oil Enhance is designed to improve the performance of your existing engine oil. Product will work in new vehicles as well as older vehicles. Add a 12 oz bottle of Oil Enhance at the time of an oil change, by replacing 12 oz of the motor oil being added. 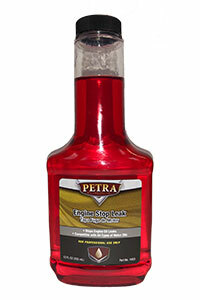 Petra Engine Stop Leak is a premium product made from unique additives and base oils. This product is designed to stop leaks in engines. 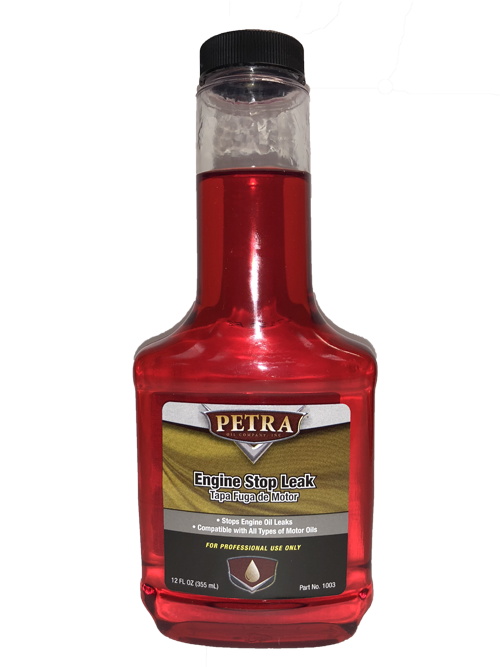 Petra Engine Stop Leak is designed to improve the performance of your existing engine oil. Product works well in older vehicles with old, worn engines. Add a 12 oz bottle of Engine Stop Leak at any time that your engine oil needs top off. For best results, use whole bottle at one time. 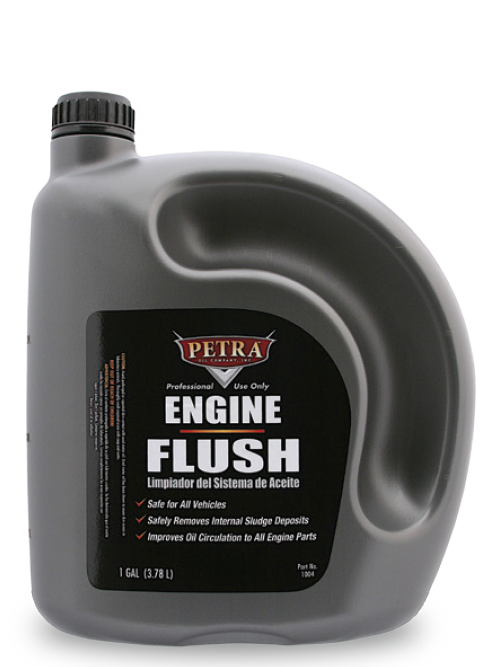 Petra Engine Flush is manufactured to create a safe and effective engine cleaning product. The formulation was designed to be used in conjunction with preventative engine maintenance. The gentle combination of Petroleum Distillates and hydro treated oil provides a common carrier for a dispersants designed for the specific purpose of dissolving carbon and other resulting effects from burning oil and fuel in the automobile (passenger vehicle). This highly refined mineral oil and additive will advance the effectiveness of the PMO by reducing toxin content. 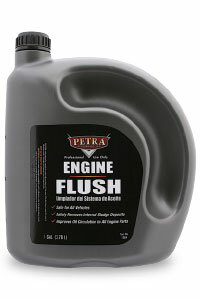 Petra Engine Flush is a fluid intended for the sole purpose of engine cleaning. The product can be used in conjunction with all motor oils and will not impact the chemical make-up of the fluids used after this product in any significant manner. 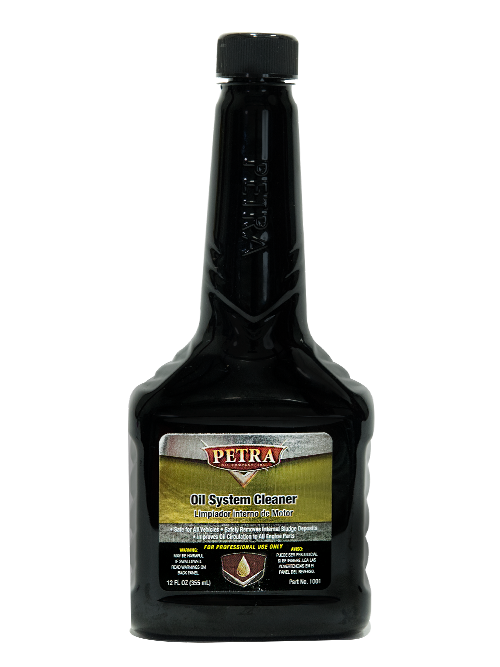 Petra’s High Mileage Oil Treatment is designed to be used with every oil change to help reduce low compression, smoking , blow by and oil burning symptoms of old, worn engines. 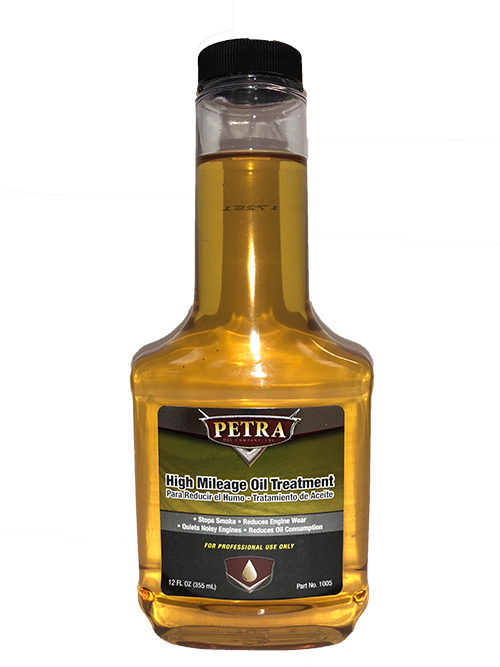 Petra’s Oil Treatment will coat moving parts with a tough film that decreases friction and increases power. 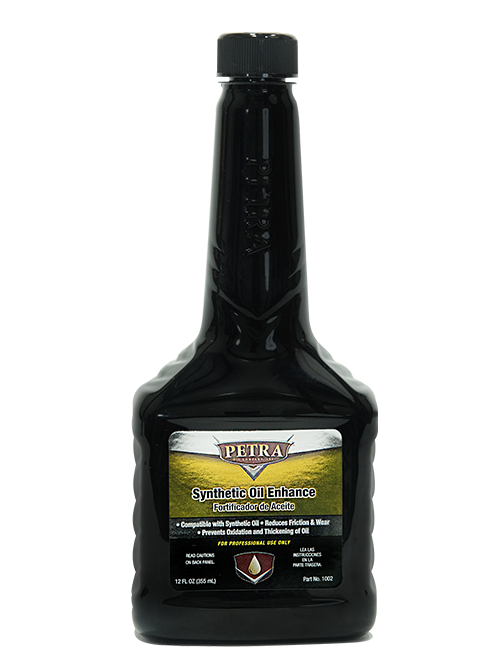 Petra’s Oil Treatment contains a synthetic polymer and additives which will improve the viscosity index of motor oil. 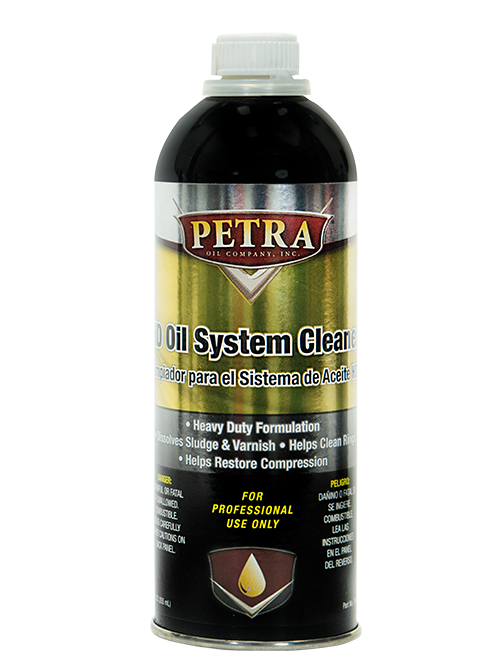 Petra HD Oil System Cleaner is an extreme formulation designed to fight through tough carbon deposits, sludge, varnish and help clean gum-like substances that may be clogging rings. When all other oil cleaners fail. Petra HD is formulated to prevail. This heavy duty formula is designed to help restore the compression of your vehicle’s engine. PetraSyn-X Synthetic 0W-20 engine oil is formulated to help improve fuel economy and provide excellent all weather engine protection. 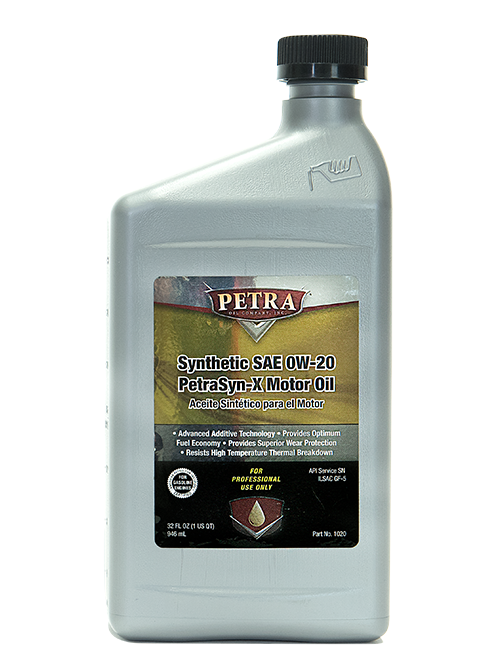 Petra Syn-X Synthetic 0W-20 engine oil meets or exceeds all automobile and light duty truck warranty requirements for gasoline and turbocharged engines where an API SN/CF SAE 0W-20 engine oil is recommended. 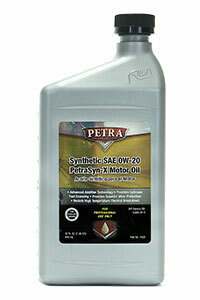 Petra engine oil SAE 0W-20 meets or exceeds all requirements for ILSAC GF-5. Petra engine oil contains select viscosity index improvers to provide easier cold weather starting and better high temperature protection demanded by modern high output engines. Follow manufacturer’s recommendations for viscosity grade and API service category. This oil is suitable for use and meet or exceed the performance requirements of many automobile manufacturers for service fill oil: 0W-20 (Chrysler MS-6395, Ford WSS-M2C930-A). Meets or exceeds all automobile and light duty truck warranty requirements for gasoline and turbocharged engines where an API SN and prior categories SAE 0W-20 engine oil is recommended. Petra engine oil SAE 0W-20 is energy conserving and meets ILSAC GF-5 specifications. Petra engine oil is formulated to help improve fuel economy and provide excellent all weather engine protection. Petra engine oil contains select viscosity index improvers to provide easier cold weather starting and better high temperature protection demanded by modern high output engines. PetraSyn-X Synthetic 5W-20 engine oil is formulated to help improve fuel economy and provide excellent all weather engine protection. 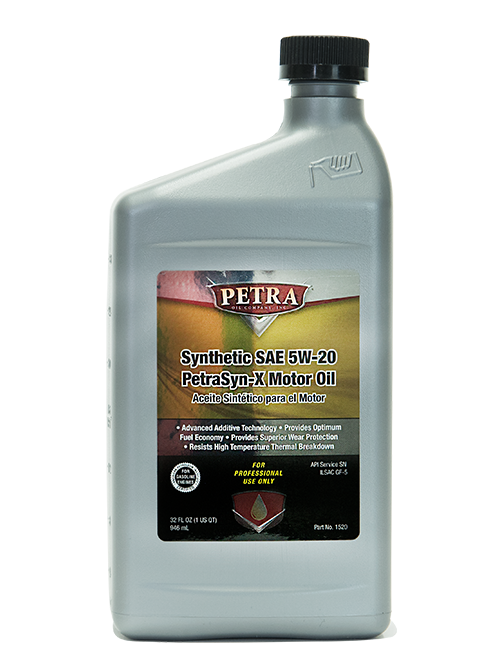 Petra Syn-X Synthetic 5W-20 engine oil meets or exceeds all automobile and light duty truck warranty requirements for gasoline and turbocharged engines where an API SN/CF SAE 5W-20 engine oil is recommended. 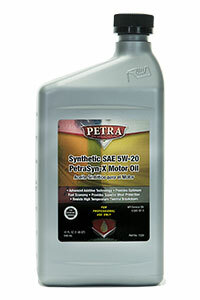 Petra engine oil SAE 5W-20 meets or exceeds all requirements for ILSAC GF-5. Petra engine oil contains select viscosity index improvers to provide easier cold weather starting and better high temperature protection demanded by modern high output engines. Follow manufacturer’s recommendations for viscosity grade and API service category. This oil is suitable for use and meet or exceed the performance requirements of many automobile manufacturers for service fill oil: 5W-20 (GM 6094M, Chrysler MS 6395Q, Ford WSS-M2C930-A). Meets or exceeds all automobile and light duty truck warranty requirements for gasoline and turbocharged engines where an API SN and prior categories SAE 5W-20 engine oil is recommended. Petra engine oil SAE 5W-20 is energy conserving and meets ILSAC GF-5 specifications. PetraSyn-X Synthetic 5W-30 engine oil is formulated to help improve fuel economy and provide excellent all weather engine protection. Petra Syn-X Synthetic 5W-30 engine oil meets or exceeds all automobile and light duty truck warranty requirements for gasoline and turbocharged engines where an API SN/CF SAE 5W-30 engine oil is recommended. 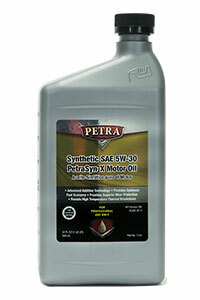 Petra engine oil SAE 5W-30 meets or exceeds all requirements for ILSAC GF-5. Petra engine oil contains select viscosity index improvers to provide easier cold weather starting and better high temperature protection demanded by modern high output engines. Follow manufacturer’s recommendations for viscosity grade and API service category. This oil is suitable for use and meet or exceed the performance requirements of many automobile manufacturers for service fill oil: 5W-30 (GM 6094M, Chrysler MS 6395Q, Ford WSS-M2C929-A), ACEA A3/B4-04 (including ACEA 2007 version), VW 502 00/505 00, VW 503 01, Mercedes Benz MB p229.5, Porsche and BMW LL-01 (Longlife – 01). Meets or exceeds all automobile and light duty truck warranty requirements for gasoline and turbocharged engines where an API SN and prior categories SAE 5W-30 engine oil is recommended. Petra engine oil SAE 5W-30 is energy conserving and meets ILSAC GF-5 specifications. Petra Synthetic Diesel Engine Oil is specially formulated to ensure superior lubrication and long life. Premium grade diesel engine oil that provides protection and oxidation resistance for highly rated diesel engines running in severe service conditions. Shown to be versatile as well as able to meet the grueling demands of today’s low emission diesel engines, as well as the older models which are using both low and high sulfur fuels. Recommended for use in a variety of heavy duty uses as well as operating environments. Off the highway applications such as trucking, construction, agriculture and quarrying. Performs well in low emission diesel engines which increase the demands on engine lubricants. Contains properties which provide anti-wear and anti-scu. Maximizes oil flow to the critical bearing surfaces during start up. Extended drain capabilities- excellent water tolerance.